The Bar Council of India is created by the Advocates Act, 1961, with the singular aim of having a statutory body to regulate the profession of law, and the class of legal practitioners. Accordingly, the Bar Council has several functions including the laying down of the standards of professional conduct of advocates, to promote and support law reforms, promote legal education, etc. To achieve these ends, the Bar Council has been given enormous powers. In the earlier days, the Bar Council was headed by the likes of Motilal Setalvad, Chandubhai Daphtary, Ram Jethmalani, and a present sitting Judge of the Supreme Court. In all these years of its existence, the Bar Council has perhaps consciously stuck to its brief, and not overstepped its statutory remit – and rightly so. Over the last few months, however, the Bar Council has taken on a rather proactive role – the motivation for which is unknown. It is relevant to note that the leadership of the Bar Council has not seen an election for considerable time – owing to the Certificate and Place of Practice (Verification) Rules, 2015, and is currently functioning under a Chairperson, a Vice Chairperson and several Co-Chairpersons (a post which is not provided for in the Statute) in what seems to be a power sharing arrangement. But that is another story. It appears that the Bar Council has, suo motu, enlarged its powers to discipline the legal fraternity, and extended the same to disciplining Judges, sitting and retired. For example, after the unprecedented presser on the 12th of January this year by the four senior-most Judges in the country after Hon’ble the Chief Justice of India, the Bar Council gave the impression of being an arbiter between disputing Judges of the Supreme Court – as though the Judges cannot manage their affairs. Thereafter, the Bar Council has been critical of certain Judges of the Apex Court – Judges who have sworn to protect, preserve and uphold the Constitution and the laws – for having taken stands or aired views, without apparently paying much heed to the high offices of the Judges and the heavy responsibilities shouldered by them. The present piece does not intend to deal with the issues of apparent differences between the Judges, but the role of the BCI, is supposedly attempting to discipline Judges. 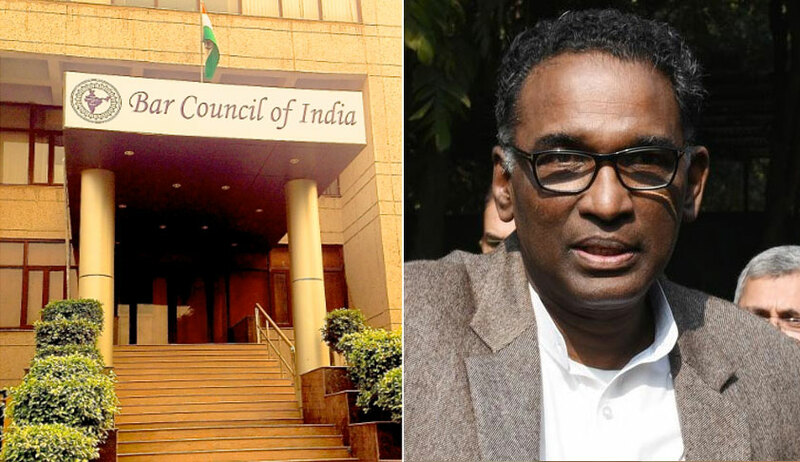 On Friday last, when the senior-most Judge Justice Jasti Chelameswar superannuated and laid down office, several media persons sought to interview the just retired Judge, especially due to extraordinary circumstances that prevailed in the last two years of his tenure. And the Judge obliged. As a part of the prevalent breaking news culture, anything that the Judge said became news instantly. And that was that. The Bar Council, however, seems to have taken umbrage of these interviews and issued a rather questionable press release – seemingly on behalf of 99.9% of the legal fraternity. Amongst those things which are askew with the press release is that the name of Justice Chelameswar has been wrongly mentioned as being “Chemeleshwar”. It is extremely difficult to digest that the Hon’ble Chairperson and the other Hon’ble gentlemen who have apparently appended their signatures to this press release are not aware of the name of the Judge. Besides the serious error in the name of the Judge, the BCI has apparently taken on the role of disciplining Judges and reminding them to exercise self-restraint – a virtue which is apparently forgotten by the Judges of the highest Court in the land! This claim is simply amazing. For lawyers to lecture Judges of the constitutional courts on behavior is not unknown – but the propriety of the Bar Council to reprimand them supposedly on behalf of 99.9% of the Bar is surely unprecedented and most certainly out of line. To tell a former Judge of the Supreme Court in the country that statements made by him in the public domain “cannot be tolerated, accepted or digested by the Advocates including the rest of the countrymen” would most certainly raise the question of whether the Bar Council has any representative voice to make such a bald and sweeping assertion. And this assertion is, to say the least, disturbing. The press release is also misleading for inaccurately stating that Justice “Chemeleshwar” resorted to employing the phrase “bench fixing” in his interviews – as such an assertion could have only been made by one who didn’t care to watch the interviews, where the Judge categorically refused to subscribe to the phrase. The Judge rather candidly spoke about issues facing the judiciary, which the BCI seems to have, obviously by deliberate oversight, altogether missed. As aforementioned, the press release seems to suggest that 99.9% of the legal fraternity subscribes to these rather extraordinary views! Surprisingly, the Bar Council of India has maintained a stoic silence about some of the serious issues pertaining to the judiciary, like the mounting of vacancies in the High Courts (more than 40%) and the Supreme Court, and the non-appointment of Judges recommended by the Collegium for farcical reasons. Perhaps in one’s naivety, one believes that the Bar Council ought to raise these issues, not realizing that the disciplining of the views of retired Judge are obviously more important! The question of whether the Hon’ble and most distinguished Members did sign the press release, especially due to the amazing inaccuracies including the name of the Judge, lingers. For one would reasonably expect that these high-ranking and Hon’ble gentlemen (sadly no woman) would be conscious of the inaccuracy of the statements made therein. Or would one be wrong? The representative character of the Bar Council is only within the remit provided for by the Statute – not an inch more. The Bar Council has not the power to discipline Judges, sitting or retired, and to express themselves, in a manner which can most gently only be described as partisan. The Bar Council does not have the power to arrogate to itself powers or representation which is not envisaged in its parent statute, and therefore, it cannot claim to be representative of the body of advocates in any manner while admonishing Judges in this fashion. At best, the statements made in this very questionable (and highly inaccurate) press release or any other statements made by the Hon’ble gentlemen who hold office in the Bar Council, admonishing Judges, is only the personal view of the individuals expressing such statements. Certainly not in the name of the 99.9% of the legal fraternity. Most certainly not in my name. Amit A. Pai is a lawyer practicing at Supreme Court of India.